I love a sweet treat this is just a single bite. Often times, that is all that is needed to satisfy my yen for something to satisfy my sweet tooth. These delicious chocolate and rum butterscotch balls are bite sized and just full of flavor. They are really easy to make too. Just combine all the ingredients, and shape into balls and allow them to set. Treat yourself to these butterscotch balls. 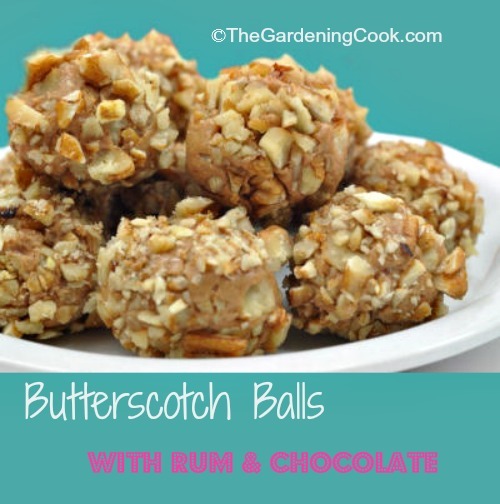 These yummy butterscotch balls are very easy to make and delicious. The recipe combines dark chocolate, dark brown sugar and walnuts together with a few other pantry staples. For more recipes, please visit The Gardening Cook on Facebook. These delicious chocolate and rum butterscotch balls are bite sized and just full of flavor. They are really easy to make too. Combine the brown sugar, salt, vanilla extract, butter, milk and rum in a saucepan. Bring to a boil, stirring all the time, and remove from heat. Whisk in the dark chocolate and allow the mixture to cool at room temperature. Add the powdered sugar in 1/2 cup amounts stirring each time you add the sugar. If batter becomes too firm transfer on a board dusted with powdered sugar and mix by hand. The batter will set and become firmer in 10-20 minutes. Shape in 1 inch round balls and roll in chopped walnuts. Place on parchment or wax paper and place in refrigerator until ready to serve. Makes about 3 dozen 1" balls.